Come enjoy our renovated main hall. The fire place is the captivating focal point of the room. On each side are entrances to the previously renovated kitchen, providing a great circular flow from the main hall and both of the building entrances. Or enjoy meal a prepared out side on the BBQ pit. A popular meeting place after many of the Spring - Fall leagues, for a quick bite to eat. 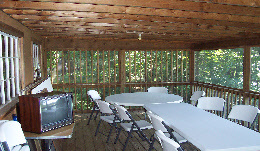 Enjoy eating your fixings at the picnic area, the main hall or out on the screened porch. The porch is a popular meeting place and provides a great place to relax and socialize after a day of hunting, fishing or shooting. The view out over the pond is spectacular.